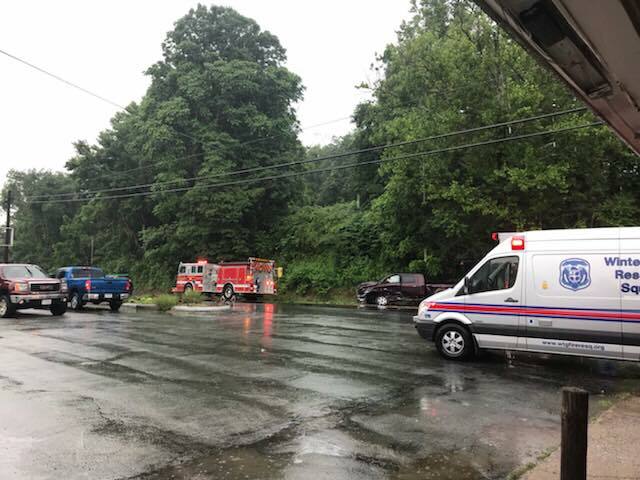 Wintergreen Fire and Wintergreen Rescue Squad were dispatched to a two-vehicle motor vehicle crash reported as a head-on collision in front of Blue Ridge Pig in Nellysford. When units arrived on scene they were faced with two vehicles with heavy front-end damage with fluids on the ground and heavy rain. Both lanes of traffic were blocked for a short period of time until debris was cleared from the road. Fortunately, there were no transports from the scene. Units on scene were Wintergreen Engine 1, Squad 1, Medic 176, Nelson Sheriff's Office, and Virginia State Police. Photos are courtesy of Blue Ridge Life, Facebook.